As a complete contrast to yesterday, today was bright and sunny with a slight nip in the air! We took advantage of the fine spring weather and drove through Freising in Bavaria to the oldest brewery in the world, Weihenstephan, a brewery which has been in operation since 1040. Weihenstephan is also a branch of the Munich University of Technology for Life Sciences and attracts international students for learning to brew beer. 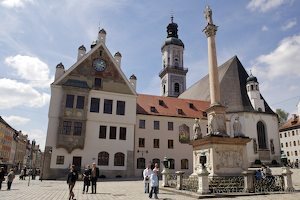 Our next Freising destination is the Marienplatz in the town centre, which boasts an old Town Hall (Rathaus) building and is backdropped by the Freising St. George’s Church Bell Tower. We head to the best ice cream in Freising along the Obere Hauptstrasse and walk the streets of Rolf’s old stomping ground. We decide to hit the back roads for a while which take us through rolling, green countryside and through picturesque Bavarian villages. Returning to Freising we make one last stop for a photo of another of the world’s oldest breweries, the Hofbrauhaus Freising brewing since 1160. Marienplatz in Freising, Germany, Bavaria, Europe.